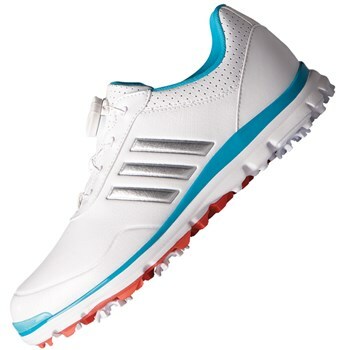 The Adidas Ladies Adistar Lite Boa golf shoes deliver incredible levels of style, comfort and function will on the course. A premium microfibre leather has been used to create an athletic style that will look great with any legwear. The upper features the excellent Adidas climastorm technology that provides a highly water-resistant finish. Adidas have incorporated the brand new L6 Boa lacing system which is conveniently located on the top of the tongue. Simply click and turn for a more stable comfortable fit. The inner of the Adistar Lite Boa golf shoe features a cloudfoam insole which is lightweight abd provides extra cushioning and comfort. An outsole design features a 6-cleat configuration will provide enhanced grip, stability and traction on all types of surfaces.